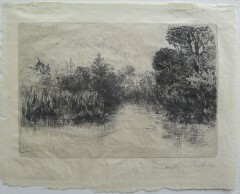 Seymour Haden, etcher and mezzotint engraver of landscapes, marine subjects and portraits. 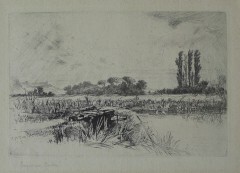 Born in London, he practised as a Surgeon, etching in his spare time. 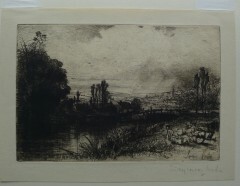 He completed over 250 plates and most of them dating from 1858 when Whistler stayed with him in London. He often worked on plates in situ. Whistler married Haden’s daughter. They had considerable influence on each other’s work and together they were regarded as founders of the Modern Etching Movement. Haden greatly admired Rembrandt’s work and had a large personal collection of his etchings. 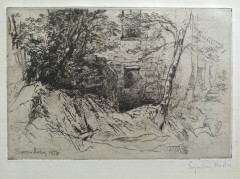 In 1879, he published a book on Rembrandt’s etchings listing them, detailing the problems with authentication and the (continuing) problem of dating his work. He founded the Royal Etchers Society in 1880 and was it’s president until his death in 1910.